Click to put a check mark next to each of the components that you are going to register. 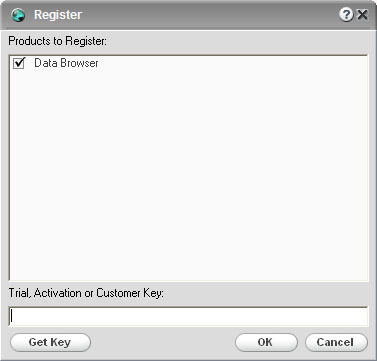 Enter your Customer key (if you bought the components) or your Trial key (if you are performing an evaluation). We recommend that you copy and paste the key instead of typing it in manually. You can always request a Trial or Customer key by clicking the "Get Key" button. If your machine is set-up for e-mail with a standard e-mail client, choose "Register via e-mail", otherwise choose "Export Request". Export Request will produce a file and display the path to the file. Write this path down. You will follow the instructions to e-mail the registration request in from another machine.